I’m far from having 10k fans on my facebook page but it’s nice to be part of one who’s celebrating such. 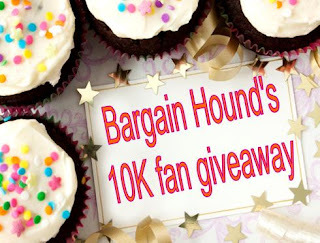 I joined Bargain Hound’s 10k fans giveaway and you get the chance to join too! Win 150$ – grand prize and 60$ for liking pages, following blogs via GFC or following twitter users. Before you go on clicking, please read this Blog Contest Etiquette write up first. ^_^ This giveaway is very easy – all done via rafflecopter. Have fun! I joined too. Good luck to everybody! Hi! I’m joining in :).